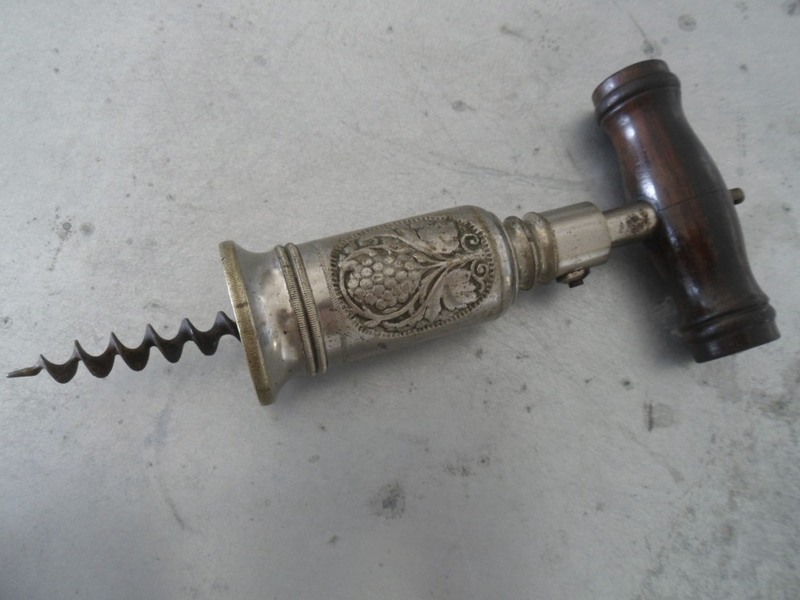 Yes, the ICCAuction will soon be open for corkscrew listings, and it will be interesting to see what rare corkscrews turn up. I will listing a few, but this time around, I am definitely hoping to add a few to the collection. 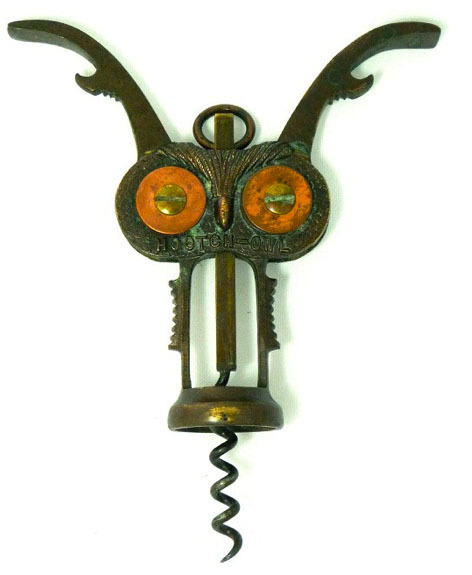 The auction will open for listings on October 29th–I know it is a few days off, and surely collectors’ corkscrew-pavlovian-juices will be flowing. If you would like a preview of some that I will be listing, here are a few pictures. There may be a few others… Be sure to check out the auction! 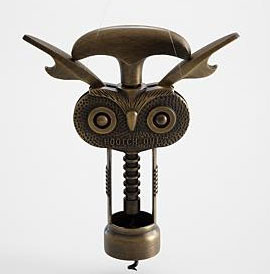 Okay, before you get all excited about this, this isn’t the hootchie that you are thinking. 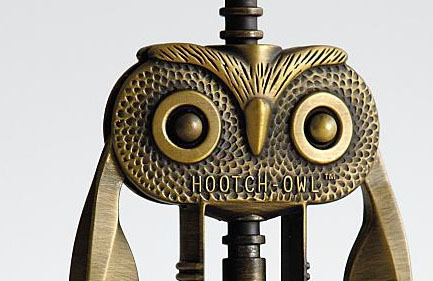 Nope, our much beloved Hootch Owl corkscrew has evolved into a different beast. And, is being sold by Red Envelope. At 49.95, he has a strikingly similar look, but is definitely a bird of a different feather. For those that are interested in picking the little hootchie up, you can link to Red Envelope here. Yes, the aforementioned guest who had their ability to distinguish the difference between Grey Goose and Smirnoff vodkas challenged was vindicated. She definitely could tell the difference! And, to be quite frank, so could everyone else–Smirnoff was the least favorite of the four that were blind tasted. In order, it went Grey Goose with 6 first place votes, Cold River in 2nd–although two tasters had CR at the top of their votes, with Absolut coming in third on all ballots, and Smirnoff dead last. In corkscrew news, I received a Bennit patent today in the mail, and was pleased to see it was marked “MAGIC CORK SCREW PAT. MAY 15-83.” I have had many Bennits over the years, and this is actually the first one that I have owned with this marking. Also interesting is the tapered shaft above the bell, I need to dig out my other Bennits to compare. Is this normal? There will be a small gathering at 65 Atlantic this evening, and I have been making preparations for the festivities. As it happened, a recent guest at our house challenged another guest that they couldn’t tell the difference between two unnamed vodkas. The other guest, of course, was quite convinced that the difference would be quite clear. And, so it was decided that we would have a blind vodka tasting. But, since we are going to have a small gathering at the house to taste vodka, the lovely and I figured we might as well get some fresh North Haven oysters delivered. So, 40-50 oysters are about to be shucked and a mignonette will be prepared. Oysters love vodka! And, we shall see who can tell the difference between the vodkas. To mix it up however, the lovely and I picked up a couple others so there will be 4 tasted blind. With four small glasses of vodka, we also thought it would be a good idea to have some other food available. We can’t have 8 people passed out around the dinner table. I mean, we can, and probably have, but it is probably not a good idea. I will update the blog as to the results of the tasting. 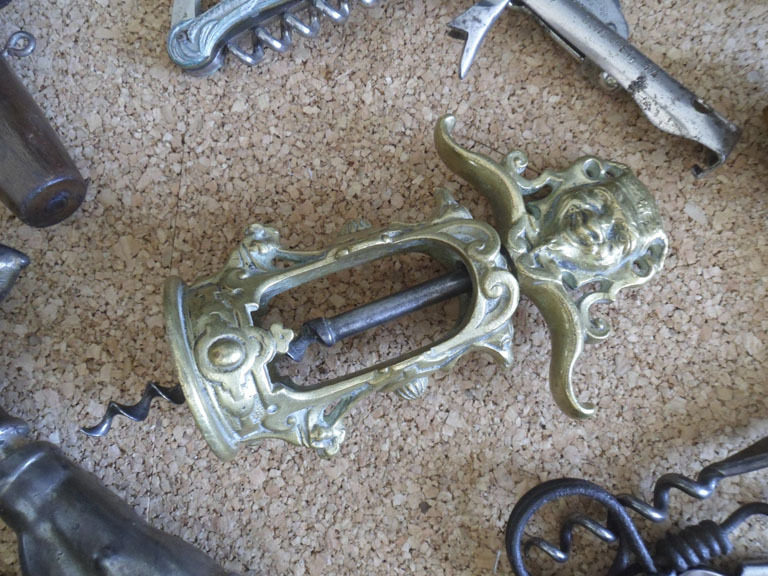 The other day I received an email offering several corkscrews for sale. And, the collection was quite nice, Strait Patent, Power Cones (yes, two of them), Chinnocks (yes, two of them), and several others. I responded asking for pricing, and after seeing the prices, I had to think about which one (or two) might be worth emptying the paypal account for. 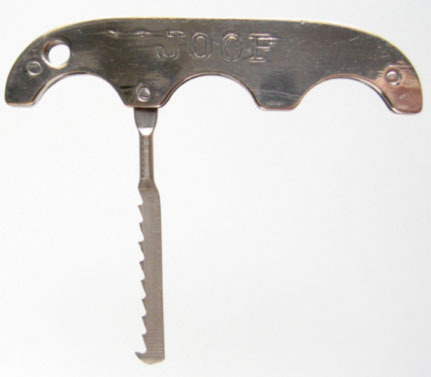 After a follow up email, another group of pictures arrived, and within a grouping of pocket corkscrews was the JOOP corkscrew. Joop? you are still asking? Yes, JOOP, a prong puller of Norwegian origin. A really unusual and hard to find cork puller, it will be a nice addition to the collection, and just might make the best 6. 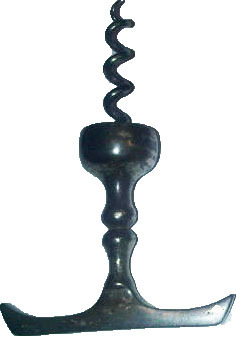 And, accompanying the JOOP is an interesting T handled corkscrew with bell assist. I remember seeing this somewhere, but can’t remember where. Anyone have an idea of where this comes from, please feel free to send an email. aren’t you a phone company??? Yesterday, I happened to call our ISP folk. We had set up a wireless router in the apartment a while back, and they had sent us the wrong router. Not wanting to be charged, and hoping to send it back to them, I decided to give them a call. So, I went to their website hoping to find customer service, and then clicked on the “contact us” link. Nowhere on the page is a phone number–they are a phone company as well. I googled around a bit, and finally found an 866 number, and after dialing–and listening to all the prompts, chose one and waited. This, I found amusing. “but…aren’t you guys a phone company?,” I asked. This stumped him for a minute, but then he understood the humor in it. After receiving a new 866 number, and dialing. I listened to the exact prompts which were given with the first phone call. ??? But, wasn’t this the direct line to customer service. Perhaps we have different definitions of direct. I pushed the appropriate corresponding number, and got (fortunately) someone else. I again explained about the incorrect router, and where could I ship it to. She explained that they are not set up to receive routers/modems/etc. Anyway— back to corkscrewing. After a little online hunting around, and 8 short emails between a seller and I, I did manage to pick up a corkscrew yesterday. Nothing truly rare, but at 20 gbp including shipping, it will be a nice addition to the collection. 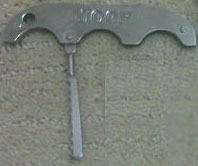 Last week, an interesting multi-tool was listed on eBay with an opening bid of ninety-nine dollars. It sat there for a while with no bids, and then over the coming days crept up just a bit from there. I had my eye on it, hoping that it would languish unnoticed, and then I would manage to acquire it for just over the opening price. When we headed off to a wine tasting yesterday afternoon, the Haynes-Bates was up to a couple hundred bucks. More than I had hoped for, but something that was still worth considering. Hoping and considering, apparently don’t help when you don’t place a bid. And, I didn’t even bid–I had a sense that this one was going to blow past anything I would have thought was reasonable. And, with the likes of fotodeal lurking, I figured my chances would be better finding one while combing the fields of Brimfield (hopefully for significantly less). With no snipe bid set, I poured wine for a while, and then a group of us hopped in a skiff and headed over to NeBo for dinner–I recommend the Oystertini should you ever get to go; martini with a raw oyster at the bottom of the glass. Yum! But, I digress. When the dust settled, the haynes-bates multi-tool ultimately sold for 891.99 (Waaaaaaaaaaaaay beyond what I would have been bidding). And, from the looks at the bidder list, fotodeal wasn’t even in the running. SPOON! 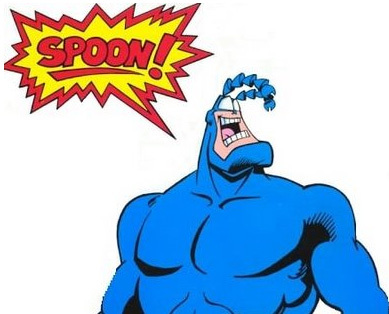 Was the Tick’s battle cry, striking fear into the hearts of evil doers everywhere. And, while I was not meaning to strike fear yesterday, I was reminded of our blue superhero when I was triumphant in winning a wonderful folding spoon corkscrew at auction. 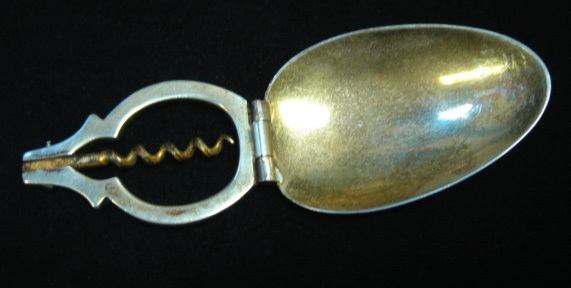 When I was first collecting corkscrews, and living in Connecticut, I happened upon an estate sale and after wandering around found a similar sterling folding corkscrew. With it lacking a price tag, I headed up to the person conducting the estate sale, and inquired as to the price. My limit being about 5 dollars per corkscrew at the time, when the estate saler quoted a price a couple hundred over my limit, I put the spoon/corkscrew back down on the table, and headed off. 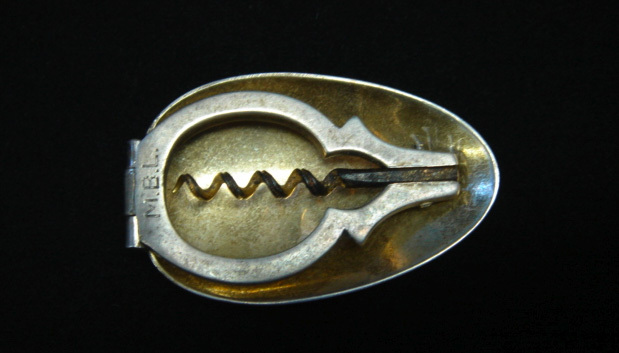 And, to this day–well, until yesterday at about 5 o’clock–I have been on the hunt for a similar corkscrew.